Education is a cornerstone of societal well-being, and a means by which people around the globe can improve themselves, their circumstances and their communities. However, access to educational resources is not guaranteed for everyone, whether due to cost, local capacity limitations, or geographic barriers. These educational discrepancies are most common in developing economies and countries, including many African communities. Against these seemingly negative trends, there has been a noteworthy rise in online educational resources that, enabled by increasing web accessibility, could fill in some of the gaps where traditional education falls short. But who is accessing these resources, what is the perception of online education, and what can we expect as internet and mobile bandwidth broaden in areas that most need higher education? Fast Company recently approached us with these very questions, which prompted us to turn to our global GeoPoll network for answers. Over 24 hours, we administered surveys in Kenya and Ghana, gauging user access to the internet, their familiarity with online education resources, and their education level. Findings, based on 899 responses, reveal similarities across countries, and indicate a possible upward trend in online education adoption in the next year. 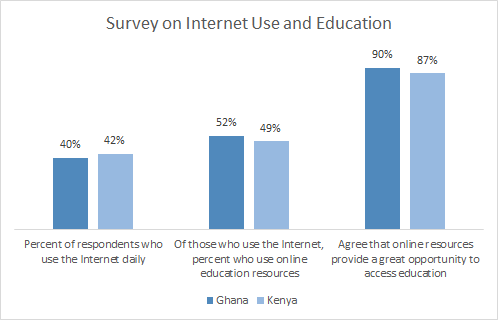 According to the survey results, 64% of Ghanaians and 58% of Kenyan respondents access the internet at least once a month, making them eligible for online course success. Of those responding who do access the internet, roughly three fourths use search engines to informally further their education, while half use online education resources, whether from education websites, digital books or Massive Open Online Education (MOOC) lectures. When asked to weigh on the perceived value of such resources, an overwhelming 88% agree that they provide great opportunities to further one’s education. Finally, among the respondents who skew young (15-29) and male (between 66% – 75%), attendance in post-secondary school — not necessarily completion — hovers around 38%. All in all, the combination of rising internet access (outlined in McKinsey’s recent report), an unpredictable education market, and increasing awareness of online education resources point to a good year ahead for continuing one’s education. We were pleased to pull this data, and give a voice to populations the world often doesn’t hear from. Read the full Fast Company article on the future of online education in the developing world here.